“Ball-bustin’ blues straight outta Bedfordshire. Think Black Keys, think B.B. King, think big fat guitars" - Classic Rock Magazine. The SIRKIS/BIALAS QUARTET is a new collective between Israeli UK resident drummer Asaf Sirkis and Polish vocalist Sylwia Bialas. With the emphasis on band interaction and the sheer joy of playing they celebrate music covering a wide range of influences and dynamics, from the most delicate ballad all the way to high energy electric virtuoso lines and everything in between. "One of the nation's finest bands in ANY genre. Firm favourites on the blues & jump-jive scenes, The Cadillac Kings feature five of the UK's top blues and roots musicians. Inspired by the sounds and styles of the ‘40s & ‘50s with a distinctly modern take lyric-wise, this is a band with a reputation for wowing their audiences, from intimate clubs to major festivals, from theatres to dance-halls, the length & breadth of the UK & Europe, from the Canaries to the arctic circle! This gig kicks off a series of monthly (amicable) Bedford musical invasions bringing you some of Bedford’s finest song-writing talent. 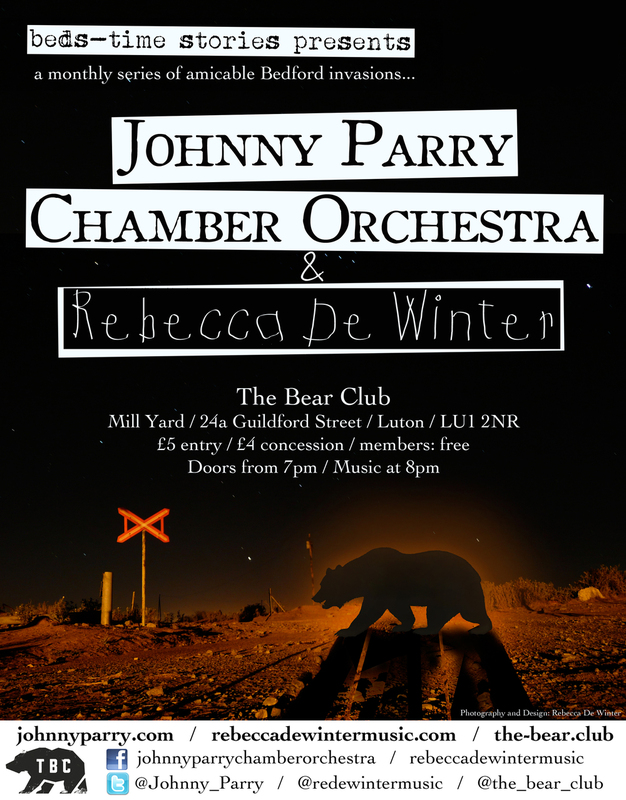 The Johnny Parry Chamber Orchestra deliver an unusual marriage between intimate singer-songwriter, think Cohen, Cave, and Waits, coupled with the sweeping final-scene grandeur of Morricone, Nyman or even Shostakovich. All underscoring bespoke live films by artist Andy Holden. The most recent album, ‘An Anthology Of All Things’, couples the orchestra with a 50 piece choir, and was listed in the 10 Best Albums of 2014 by The Guardian's Imogen Tilden. Also performing is the sublime Rebecca De Winter. Expect charming tales of of unusual characters, trinkets of the human condition, woven together into a set of perfectly concise and unique songs with a sound that fuses the Alternative Pop soul of Ryan Adams with the pure piano balladry of Ben Folds and Regina Spektor. - Jazz Journal International (5-star review). Expect a dazzling display of contemporary fare, ranging from Turkish panache to soundscapes of latin America to English pastoralism. Hear this played on nylon string, steel string, electric, 12 string, fretless, slide, synth, glissentar guitars and more! For their live gigs, the Oxley-Meier guitar duo aim to entertain by playing with a spontaneity and an intuitive interplay between them that keeps them fresh and fired up from gig to gig. London based hard bop pianist Leon Greening presents his trio with Adam King (double bass) and Steve Brown (drums). Regular performers at Ronnie Scott's, tonight they'll be playing some tracks from Leon's CD 'Cookin' In Brooklyn' which features tunes by some of his biggest influences, including Bud Powell, Bobby Timmons, Wynton Kelly, Victor Feldman and Dudley Moore, plus some originals. Recent recipient of the award for 'Best Piano Player 2014 at Bronte Blues Club', Dale is currently touring to promote his new solo album 'New Orleans Piano:LIVE'. This is an intimate solo show with piano and vocals, but it's musically diverse, ranging from an up tempo boogie to a slow minuet whilst always rooted in New Orleans Rhythm n’ Blues. 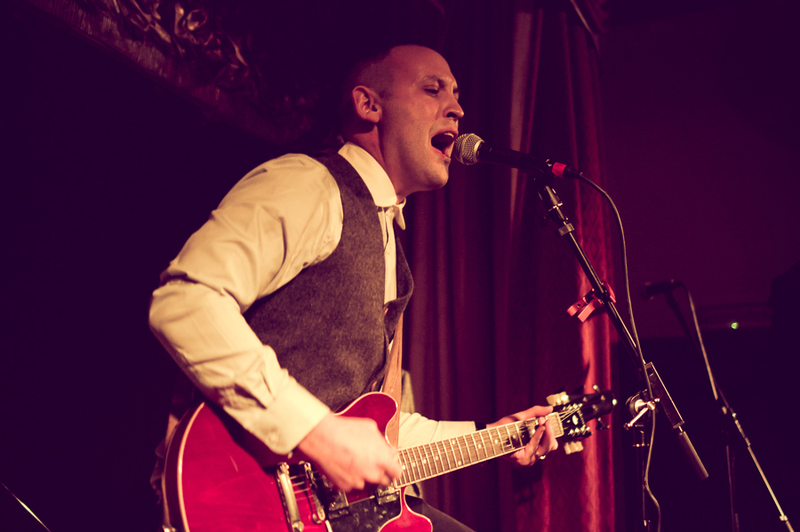 2008 Indie Award Nominee Graham Robins continues his monthly residency at The Bear Club with his trusty band and the odd special guest, in an ever-changing programme of soul and blues. series of critically acclaimed solo releases, alongside composing a mind-boggling amount of music for TV and film. Paring the songs down for solo acoustic performance shows the full scope of Miro’s unmistakable voice.